SCVHistory.com LW2780a | Film-Arts | 'Old Yeller' (Disney 1957). 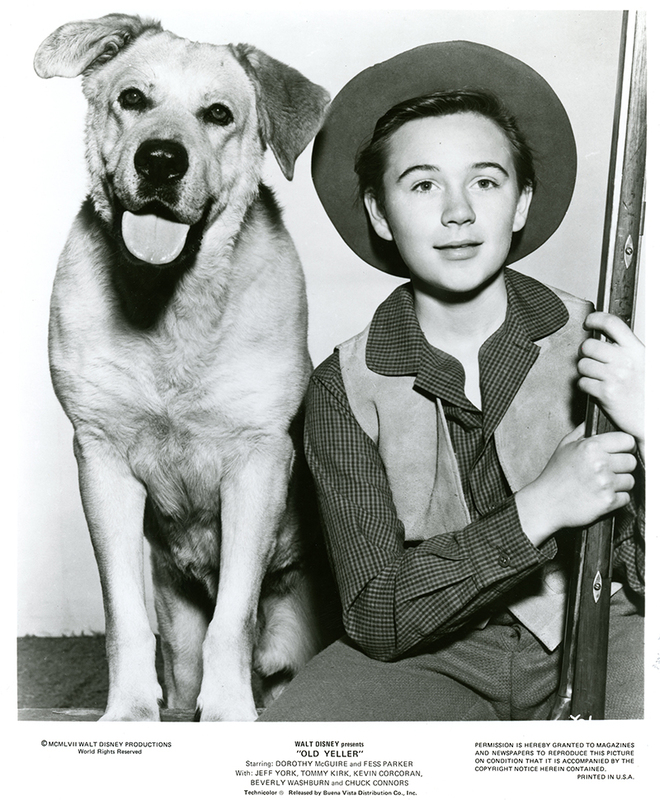 8x10 glossy publicity photograph for "Old Yeller" (Walt Disney Productions 1957). Walt Disney's deep affection for the American past has been expressed throughout his career as a master entertainer, but never more eloquently than with his newest live-action Technicolor production, "Old Yeller," starring Dorothy McGuire and Fess Parker. In this warmhearted story of a farming family in early Texas and the big, roughcut range dog who protects them from wilderness dangers, Disney evokes the charm and severity of frontier life. "Old Yeller" is a basic human tale, a blending of fun, laughter, love, adventure and tragedy. Adapted from the best selling novel by Fred Gipson, the picture was directed by Robert Stevenson. To give it fullest stature, Disney chose Jeff York, Tommy Kirk, Kevin Corcoran, Beverly Washburn and Chuck Connors for important characterizations. The title role went to Spike, a 115-pound dog actor owned by professional trainer Frank Weatherwax. "Old Yeller" is about the Coates family — Jim and Katie and their two young sons — and the big, tough stray dog who plays an unforgettable part in their lives. Dorothy McGuire portrays Katie, the resourceful mother maintaining a pioneer household while her husband is away on a cattle drive. A sensitive and observant actress, she devoted weeks of preparation to the role. The result is a bullseye performance, surpassing her highly praised work in "Friendly Persuasion." In one of the strongest roles of his career Fess Parker plays the settler-husband, Jim Coates. It is a demanding role, requiring fine shadings of characterization as Jim guides his 15-year-old Tommy Kirk and seven-year-old Kevin Corcoran, both alumnae of Disney's Mickey Mouse Club television series. Their roles in "Old Yeller," however, are wholly dramatic. Tommy plays Travis Coates, a youngster propelled into manhood by the harsh impositions of frontier life. Kevin plays his mischievous brother, Arliss. Notable supporting performances are turned in by Jeff York as Bud Searcy, a work-shirking Texas farmer; Beverly Washburn as his sweet-natured daughter, Lisbeth; and Chuck Connors as Burn Sanderson, a bachelor rancher. Spike, the canine hero of "Old Yeller," is a rags-to-riches celebrity whose history begins in the Van Nuys, California animal shelter. As a month-old inmate there in 1953, he was noticed by Frank Weatherwax, veteran Hollywood dog trainer. "He was all head and feet, but he looked smart," recalls Weatherwax. "I thought he might make an actor, so I bailed him out for three dollars." Weatherwax invested four years and $20,000 worth of training time in Spike before he got his big break as Old Yeller from Walt Disney. Spike's roughneck appearance and heavyweight build, which had proved early drawbacks to his acting career, were just what Disney was looking for. Displaying a kingly amount of talent, too, the 115-pound dog with the Mixmaster pedigree out-acted a dozen competitors for the role and trotted off with the meatiest assignment for a canine performer since "Lassie Come Home." Great books make great pictures, and "Old Yeller" holds to the tradition. It is based on the acclaimed novel by Fred Gipson, who collaborated with William Tunberg on the screen play. "Old Yeller" was serialized in Collier's Magazine and in book form was a best seller, published by Harper and Brothers, The People's Book Club and the Reader's Digest Book Club in America. It was published in French, Swedish, Italian, Spanish and Portuguese. Gipson describes "Old Yeller" as fiction based on fact. "My grandfather owned a big yellow stray dog who could throw wild range cattle and who once rescued him from a meat-eating hog. Out of these and other true incidents I wrote the story of 'Old Yeller,'" Gipson reports. Fourteen thousand virgin acres in Southern California double as the rolling hills of West Texas for "Old Yeller." This bow to California real estate was made, according to Walt Disney, because it was mid-winter when the picture began filming "and Texas was under six feet of snow at that time." The homestead setting comprised of a roomy log cabin surrounded by a vegetable garden, corn path and potato field was deceptively expensive. Forty men labored three weeks to build the cabin, and studio labor comes high. Oak logs had to be hauled from a forest 200 miles away. Shakes for the roof were split by hand. By the time the plain-looking cabin was ready for occupancy, it has cost $30,000. Corn was out of season when "Old Yeller" was shot, so Disney's moviemakers tricked Nature. With the help of a hothouse and plenty of plant food, they grew 5,000 corn stalks in the flower pots which were transplanted outdoors. Bill for the off-season corn patch: $5,000. "Old Yeller" abounds with animals and birds. All enjoyed royal attention from the corps of handlers, trainers, veterinarians and American Humane Association observers present during filming. The animal cast of "Old Yeller," with their keepers, set Disney back about $40,000. Certain creatures were practically unobtainable when he put the picture underway in January. Jackrabbits and wild hogs were particularly scarce. A herd of the latter, red-eyed descendants with four-inch tusks, of Russian boars and wild pigs, finally was found in the back country of central California. Buzzards had to be shipped from Florida, reptiles from Texas and Arizona, squirrels from Kentucky. The squirrels were sleepy when they arrived at the studio. A label on their box explained why. "Hibernating," it read. Although he doesn't appear in "Old Yeller," Mister Stork played an important part during its filming. For a key scene, Tommy Kirk as Travis Coates finds a cow and her newborn calf in the wilderness. Several expectant milk cows were located, and a shooting schedule projected. On the day planned, one of the mothers produced a baby and provided Disney with the required scene. Some of the most spectacular animal action ever filmed highlights "Old Yeller." In defending a family on the Texas frontier, Old Yeller fights off an angry 500-pound bear, a savage loafer wolf and a pack of wild hogs. For sheer excitement, few animal scenes in Hollywood history rival the furious bear and dog fight. Unusual preparation was necessary to stage the outdoor battle without harming either animal. With their welfare of first consideration, rehearsals for the skirmish began months ahead of actual shooting. Spike, the trained dog who plays Old Yeller, spent weeks on a leash getting acquainted with Doug, a nine-year-old movie bear owned by professional handler Byron Nelson. Each animal learned the others advantages. Spike was long on agility, Doug on strength. With this knowledge, the two enacted their screen scrap. And a mighty hubbub it is, full of sound, fury and primitive rage. Beyond all the seeming ferocity, however, it is a superb performance by a pair of experienced actors. This is testified to by Buster Matlock, a representative of the American Humane Association who was present throughout the picture's filming. "Both Spike and Doug knew exactly what to do," he affirms. "Also they were protected. They kicked up a lot of commotion and made it look food for the cameras, but when the dust cleared neither one had even a scratch." The same care and consideration for the participants were taken in filming the wolf and hog fights. All animal sequences in "Old Yeller" produced with the approval of the American Human Association, whose "Animals Emancipation Proclamation" guaranteeing the welfare of movie animals has been part of the Screen Production Code since 1940. Veteran Disney composer-conducter Oliver Wallace created a "period score, in the influence of the 1860's" for "Old Yeller." His music was composed to reflect the picture's mood, "very tender and rugged." With Gil George, who wrote the lyrics, Wallace also composed the title song. It feature popular instruments of the time, particularly banjo and guitar. Old Yeller is a big, battle-scarred, stray mongrel dog that appears at the Coates homestead in frontier Texas during the 1860's as Jim Coates (FESS PARKER) is leaving on a cattle drive to Kansas. Jim entrusts his wife, Katie (DOROTHY McGUIRE), and their six-year-old son, Arliss (KEVIN CORCORAN), to the protection of their mid-teen-aged son, Travis (TOMMY KIRK). Travis has gravely assumed his responsibilities as man of the family in his father's absence and is trying to till a corn path when Old Yeller, wildly chasing a jack rabbit, dashes under the plow mule. The mule bolts, and in the ensuing melee Travis drives Old Yeller off the place. But the dog turns up next day, only to win further disfavor as a thief and a coward. Arliss, however, cannot resist Old Yeller's raffish appeal. He persuades his mother to give the dog a chance, a move Travis opposes with loud scorn. Old Yeller stays popular with Arliss and unpopular with Travis until one day little Arliss catches hold of a bear cub at the family water hole. The enraged mother bear is about to attack Arliss when Old Yeller distracts her, permitting the youngster's rescue by Travis and Katie. Having thus proved his loyalty and bravery, Old Yeller becomes a welcome member of the household. The routine of pioneer life is broken by the arrival of farmer Bud Searcy (JEFF YORK) and his small daughter, Lisbeth (BEVERLY WASHBURN). During their short visit, Lisbeth confides to Travis that Old Yeller has been stealing food from neighboring farmhouses and could be shot for the thefts. Yet with this cloud over him, the dog grows indispensable to the Coates family. He keeps their corn patch free of marauding raccoons, and helps Travis find a lost cow and her newborn calf. One afternoon a rancher named Burn Sanderson (CHUCK CONNORS) comes to claim Old Yeller as his dog. Arliss protests so bitterly and Sanderson finally yields and lets the dog stay. Before leaving, he warns Travis of a hydrophobia plague spreading across the frontier. The next day Travis and Old Yeller set out to mark hogs. The lad is roping small pigs from a tree branch, as Bud Searcy had instructed him, when he falls among the vicious, half-wild animals. Old Yeller leaps to his aid and Travis escapes with a painful leg wound, but the dog is left severely hurt by the hogs' sharp tusks. Old Yeller is taken home in a dying condition. He lies at Travis' side while Katie and Bud Searcy apply poultices to the boy's leg. Lisbeth has brought a puppy, which Arliss quickly adopts. In time, both Travis and Old Yeller recover. Then, one fateful day the milk cow shows unmistakable symptoms of hydrophobia and Travis is obliged to shoot her. With this, Travis reaches the threshold of adulthood. Old Yeller, courageous as ever, fights off a wolf who threatens Katie and Lisbeth. He is badly bitten, but it is not the wounds that worried Katie. Her fears are justified some days later when Old Yeller becomes rabid. Now Travis faces the hardest task of his young life. Knowing Old Yeller has hydrophobia, Travis must destroy him. And this he does, although the experience is nearly more than the boy can bear. Travis is still empty-hearted with the loss of Old Yeller when Jim returns. His father's understanding counsel consoles him somewhat, but not until Travis sees characteristics of Old Yeller in the pup that Lisbeth brought does he regain his composure. His transition from boyhood to manhood has occurred. "Old Yeller," in color by Technicolor, stars Dorothy McGuire and Fess Parker, with Tommy Kirk, Jeff York, Kevin Corcoran, Chuck Connors, and Beverly Washburn. Bill Anderson co-produced with Disney. Robert Stevensons directed the Buena Vista re-release. Running Time: 1 hr., 23 min., 13 sec. Technicolor(R) Re-released by: Buena Vista Distribution Co., Inc.
LW2780a: 19200 dpi jpeg from original photograph purchased 2015 by Leon Worden.